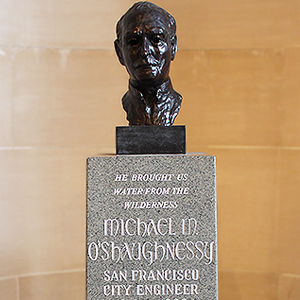 San Francisco City Engineer Michael O’Shaughnessy, who led the Hetch Hetchy Reservoir project, is honored with a bust at City Hall. In its lawsuit filed in 2015, the Oakland, Calif.-based advocacy organization, “Restore Hetch Hetchy,” sought to drain the century-old reservoir that serves the water needs of 2.6 million Bay Area residents and provides clean hydroelectric power. They alleged that the operation of the O’Shaughnessy Dam and Hetch Hetchy Reservoir violate the California Constitution. Herrera’s office countered that the lawsuit was preempted by federal law, and time-barred by the applicable statute of limitations. In April 2016, a Tuolumne County Superior Court judge rejected Restore Hetch Hetchy’s challenge and granted Herrera’s motion to dismiss the case. In doing so, the Sonora, Calif.-based judge largely agreed with Herrera’s arguments that the plaintiffs’ proposed constitutional interpretation was both pre-empted by federal law (specifically the Raker Act of 1913) and also time-barred by nearly nine decades. A three-judge panel of the California Fifth District Court of Appeal unanimously affirmed the trial court’s dismissal of the case in July 2018. The case is: Restore Hetch Hetchy v. City and County of San Francisco et al., Tuolumne County Superior Court, Case No. CV 59426, filed April 21, 2015; Court of Appeal Case No. F074107. For additional information on the San Francisco City Attorney’s Office, visit www.sfcityattorney.org.